I fell in love with kelp noodles a couple months ago after trying them for the first time at a raw restaurant in Santa Monica called M.A.K.E. I thought it sounded weird, but was feeling adventurous that particular weekend so I ordered it. Love at first bite for sure. I can’t remember exactly what they did to theirs, but it was heavenly. I knew I had to try making my own versions at home. They are the perfect replacement for glutenous noodles especially when it’s crazy hot outside (like it has been in L.A. the past week) and you don’t want hot pasta. They are quick and easy to prepare (just a quick rinse and water soak) and you can do whatever you want with them. This particular evening I was feeling like pesto, but not of the basil variety…I wanted cilantro! 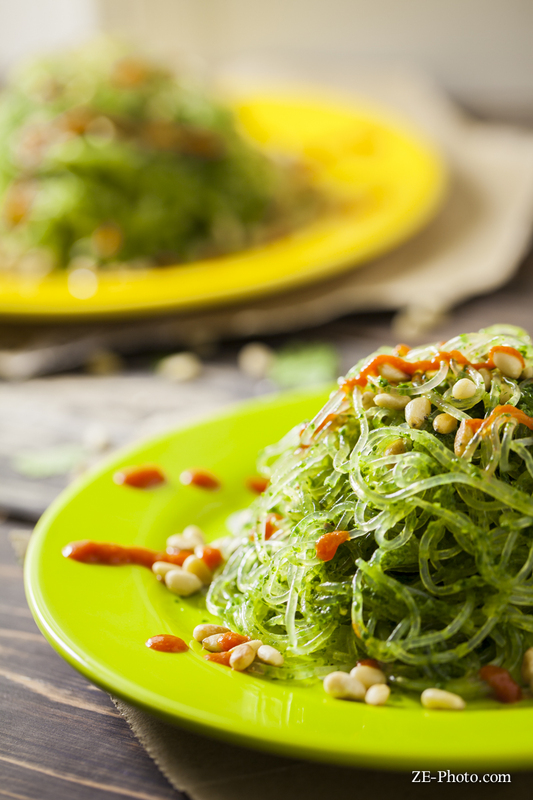 So here it is folks, the recipe for kelp noodles with cilantro pesto. Following the theme it’s both gluten-free and cheap!! Total: $6.58 or $3.29 per serving (makes 2 decent sized portions). **You could also toss the pine nuts into the food processor and blend them into the pesto if you’re so inclined, but I like having the bigger pieces of crunch in my noodles. Totally up to you!